The Delhi police has arrested around 13 persons for the violence in Mayur Vihar, Phase-III yesterday, which resulted after two men on a bike were injured as the police tried to stop them. The first day of monsoon session of Delhi Legislative Assembly that is to be started tomorrow may be disturbing as the BJP has decided to raise the issues of corruption in administration, inflated electricity bills, etc. Defying the orders of Delhi University banning "all rallies and demonstrations of any kind on campus till further notice", both the front runners of the university student elections, the ABVP and the NSUI today organized rallies on north and south campuses respectively. Want to convert property? Apply online now! Jawaharlal Nehru University is all set to face its second student union elections this year on September 14. Six months after the Jawaharlal Nehru University Student Union (JNUSU) elections made a comeback, the election schedule for the present academic session was decided upon today in an all-party meeting. President of the Delhi BJP Vijender Gupta today claimed that the CBI had found allegations of corruption in development work in unauthorised colonies to be true and forwarded a report to the chief vigilance officer of the Delhi State Industrial and Infrastructure Development Corporation Ltd. (DSIIDC), recommending stern departmental action against 12 senior engineers, but the Delhi government chose to ignore it. Delhi Chief Minister Sheila Dikshit today announced a reward of Rs 5 lakh for Arjun Awardee blind student Ram Karan Singh for his outstanding performance in Athletics Paralympics. The Delhi police today claimed to have worked out the murder case of Haryanavi folk singer Binu Chaudhary. The accused Sumit, was arrested fromthe Ghitorni Metro station. Even as the youngsters remain hooked to the online medium, e-books the theme for the 18th edition of the Delhi Book Fair, they are still to make inroads into the readership of conventional form as it appeared at this year's book fair. The Delhi police has arrested around 13 persons for the violence in Mayur Vihar, Phase-III yesterday, which resulted after two men on a bike were injured as the police tried to stop them. The situation has been bought under control, according to the police. One person was killed while 35 policemen sustained injuries in the riot. The injured included an Assistant Commissioner of Police (ACP) of Kalyanpuri, Gaurav Sharma, a Station House Officer (SHO) of Ghazipur, Sunil Kumar and one constable, Deepak, said a senior police official. All the three are said to be critically injured. Four other persons were also injured in the stone-pelting by the furious mob. One of the injured bikers is identified by the police as Kamruddin, in his 20s. He is said to be in critical condition at the Lal Bahadur Shastri hospital. A large number of policemen were deployed in the area today to avoid further violence. Following the incident, around 20 companies (1,600 men) of Delhi Armed Police have been deployed in and around the Mayur Vihar area, across the Yamuna. The police said that two cases have been registered in different police stations. "One case has been registered in Ghazipur police station against four persons and one in New Ashok Nagar, booking nine persons," said the official. The protesters had set afire a police booth, a DTC bus and many other vehicles in Mayur Vihar Phase-III, the police and witnesses said. The police said that the two-wheeler was stopped at the checkpoint as both the riders were not wearing helmets. They were drunk when a traffic policeman tried to stop them. They also argued with the policeman, said a police officer. However, people at the spot said when the vehicle did not stop at the checkpoint, a traffic policeman threw a stick at them, which hit them and they fell on the road. The police officer said that a mob collected at the spot and started throwing stones at the police team. They also set a DTC bus, a mini truck, a car, three bikes and the police booth on fire. Further probe into the incident is on, added the officer. The Delhi government today ordered a magisterial inquiry into the last night's clash between locals and police in East Delhi in which one person was killed. "A magisterial inquiry has been ordered into the clashes in which one person died. 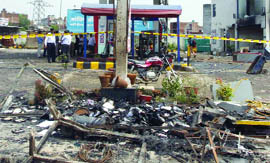 The reasons behind the clashes will be known in the inquiry," said Chief Minister Sheila Dikshit. The clash erupted in Mayur Vihar Phase-III at around 7.30 pm following rumours that a youth died after an accident at a vehicle checking picket. Opposition leader in the Delhi Legislative Assembly, Vijay Kumar Malhotra said that after the defeat of the Congress in MCD elections, Chief Minister Sheila Dikshit is bent upon misleading Delhiites by making false promises and spending crores of rupees on newspaper advertisements. Earlier, JJ colonies and middle class localities used to get electricity bills in three digits. They are now getting bills in four digits, he said. Malhotra said that prior to the Assembly elections, temporary provisional regularisation certificates were issued in respect of 1,639 unauthorised colonies and now the Chief Minister of Delhi is talking about regularising 917 colonies. Though promises were made to allot houses under the Rajiv Ratna Development Plan, only 500 houses have been allotted so far, he said. Patients have to wait for hours in the absence of doctors and staff in the government hospitals. 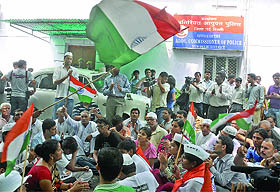 Thousands of vacancies of teachers in Delhi schools could not be filled in for the past several years, Malhotra said. The orders had been issued by the proctor office after some participants in an NSUI rally indulged in eve-teasing last Friday. Reacting to the ban, leaders from all the student parties had made it clear that a blanket ban on the rallies was no solution. The move to ban rallies on north campus comes ahead of the Delhi University Student Union election on September 14 and the parties today tried their best to find a breakthrough, however the proctor's office did not entertain any complaints and memorandums. While the NSUI organized a protest march on South Campus demanding safer transport facilities for women students, the ABVP organized a rally defying the ban with hundreds of girl students protesting against the eve-teasing incident during the NSUI rally last Friday. "We have submitted a memorandum to the Vice-Chancellor stating that curbing the rally system is not the solution. The need of the hour is to create a safe atmosphere, where each girl can feel safe," said ABVP state secretary Rohit Chahal. Amrish Ranjan Pandey, spokesperson (NSUI) said, "A minor scuffle took place between the police and NSUI activists, however no one was detained. The march started from Motilal Nehru College and ended at ARSD College. Activists submitted a memorandum of demands to the deputy proctor." The proctor's office refused to comment on the fallout of these rallies. Prof C S Dubey, the chief election officer for this year's DUSU elections, said, "We got to know about the molestation incident when some students of IP College approached the Vice-Chancellor on August 31. As a result, the university decided to take action on the rallies." "How much will the parties have to pay for the rallies held today or in the coming days on north campus, should be clear in a day or two," he added. According to the proposal agreed upon, nominations will be filed on September 5 while voting has been scheduled for September 14. The final list of candidates will be displayed by the evening on September 6. The university General Body meeting will take place on September 11 followed by the presidential debate on September 12 and finally the voting on September 14. "The proposed dates will be finalized tomorrow. The final schedule should be up on the notice board by tomorrow evening," said chairperson, JNUSU election committee, Chandan. "The rush with the elections is majorly due to the Lyngdoh Committee guidelines that the student union elections should wrap up within eight weeks after a semester begins," added Sandeep Singh, JNU unit secretary, Akhil Bhartiya Vidyarthi Parishad (ABVP). Back in March, the JNU administration conducted the JNUSU elections as a one-time arrangement after a green signal from the Supreme Court. These interim elections were conducted after a gap of over four years, ever since the Supreme Court banned it for not conforming to the Lyngdoh Committee recommendations. "The elections were conducted midway during the last semester because there was just too much excitement among the students. Without the JNUSU in the last four years, things had changed immensely. The union to be selected in September will now function all the year around. One can very well say that the elections will be the real comeback of student democracy at JNU," said a senior party member from All India Student's Association (AISA). Gupta demanded that FIRs be filed against the ministers, officers and engineers involved in the bungling. The CBI in its report has recommended imposing penalties on the guilty engineers, besides legal action. Addressing a conference, the BJP leader alleged that the CBI had forwarded the confidential report to the DSIIDC on February 22 itself, but the Delhi government, instead of taking action against the corrupt engineers, promoted them. He said that on November 26, 2007, the Delhi Cabinet laid down guidelines for the development works in 1,500 unauthorised colonies. The works to be undertaken include construction of roads and drains. These works were awarded to DSIIDC and the irrigation and flood control department and they were completed between 2007 and 09. Gupta said the CBI in its inspections had found that DSIIDC handed over the work of 11 divisions to just one superintending engineer, which was illegal. Also, the material used for the construction of roads was of such low quality that the roads got washed out in a year, he added. 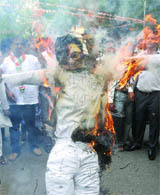 Chaudhary was shot dead on May 29, 2012 in Haridwar. With a low turnout at the Pragati Maidan's hall number 8 that displays e-versions of books and web applications, for the old-timers many of whom were spotted browsing through various stalls at hall number 9, 10, 11 and 12, print versions are still the first choice. There were many such bibliophiles, including the young and old, for whom reading is not complete without the conventional books. An ardent reader of literature, Rachna, who teaches in the English department of University of Delhi's Maitryi College, e-books are not fun at all and rather she feels a resistance towards getting them even for her kids. "Availability is the key issue and it is important to make these books available for the young. I've grown in an environment of books and to inculcate that habit among kids at home I gift them books," said Rachna, who visits the city's book fair every time and feels it is very important to revive the element of the old days. Another regular visitor, Swati Jain, a research scholar of Delhi University's geography department, prefers printed versions as they are reader-friendly. "Reading is my hobby and going through online pages is just not easy. This is my third visit to the book fair here and I'm looking for good pieces of fiction and comics too," she said, pointing out that such books still have their own set of readers.